The Llama Sanctuary is not in the business of collecting llamas! Rescued llamas and alpacas who are manageable and in good health are available for adoption and new caring homes are constantly being sought. If you believe you have the space and the energy to care for one or more of the rescued llamas, please let us know. Like most rescued animals, they may not have experienced much affection in their lives and may require considerable time and energy in instilling trust. The rewards for your love and care are often immense and there’s not much that can beat a llama hug! If you do not have the time or believe you cannot physically handle a llama, then do not give a home to one. They will require physical handling and they might not be happy about it. Left to its own devices, a llama will naturally wander and graze on a wide variety of vegetation, including eating twiggy snacks like willow twigs, tree bark and broad leafed plants. They do not ‘ring’ trees, so there is little chance of trees being killed by their bark nibbling. However,they do like to scrub in bushes, so they will destroy a lot of forest underbrush, simply by their scratching habits. They will seek out pine, spruce and other coniferous trees for both greenery and bark. They happily eat cedar fronds, birch, any poplars and most other trees including apple …Yumm! 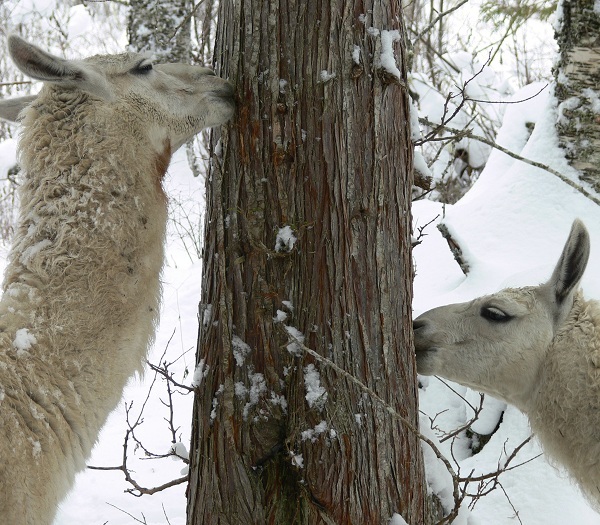 Although many llamas manage without access to trees, it certainly adds to a more fulfilling life and some seem to need the roughage for digestive health. Each fully grown llama will require around an acre of grassland to graze. If the soil and/or grass is poor then more land is required. If rich then perhaps less is required. There are stories on the Internet that llamas can live on a quarter of an acre of grass. There must be something REALLY special about that patch of lawn that will provide consistent grazing for a 400 pound llama! In the winter months, a fully grown llama will eat between 3 and 5 pounds of hay a day; that’s not much relative to other large animals. In severe weather, they may need a calorific boost from oats or pelleted feed. (oats are best). Do not feed alfalfa-rich hay! Having highly efficient digestive systems, llamas process most of what they eat, whereas most other animals, including humans, excrete large volumes of surplus nutrients. 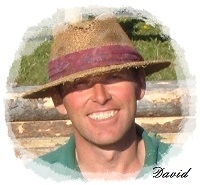 Our experience has shown that oat hay is the best all-round winter feed. In the absence of oat-hay, then a first-cut mixed grass hay is best. Generally, second cuts do not contain sufficient roughage and the alfalfa content may be much too high. A llama that is fed protein-rich hay will have very smelly breath; a strong indication that something is not right! Usually llamas have sweet breath. 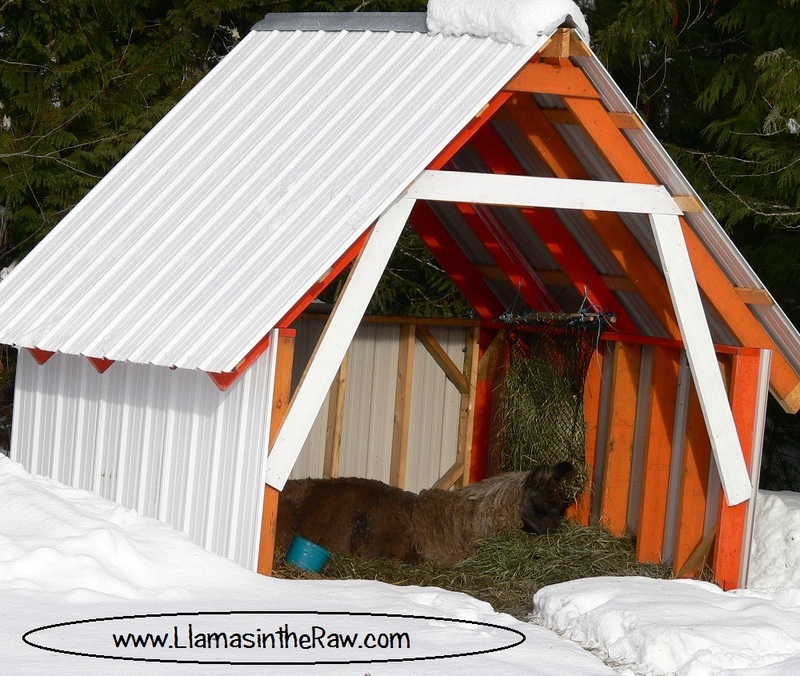 You will need to provide a llama-specific salt block or loose salts that have been created to suit your environment. Contact your local feed dealer and they should be able to help. Sheep salt blocks may be suitable in SOME areas, but not in others. DO NOT give the blue cobalt cow salt block. Like all animals, clean water is a definite requirement. Llamas drink considerably more in winter, when fed on hay. On average they consume between half and one and a half gallons a day each. 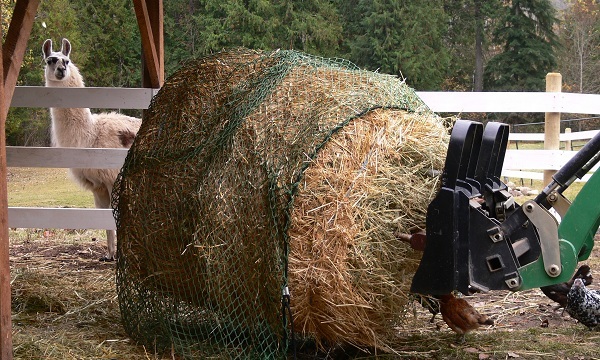 A heated water trough is necessary in many climates. If you regularly halter and lead your llama, then you will be doing him or her a huge service. The times when The Llama Sanctuary is called out to catch a llama is often in cases where the animal has not been handled. An unmanageable llama can be dangerous to humans as well the llama and in some cases the llamas end up being shot. It can be a painful and unpleasant experience catching an wild llama! If it is ever injured or sick., the chances of a vet being able to see it are virtually zero. Handle it, train it and teach it to trust. It is vitally important that the halter is fitted correctly. A poorly fitting halter can slip down the nose and obstruct the air passage, causing panic, which makes release of the halter virtually impossible. Grooming is not essential, but they not only look better, but their coats perform better in both cold and warm weather if they are kept groomed. If you have burdock in your region, then you will have to make every effort to eliminate the burdock from the grazing area. The burrs work down into the coats and can cause severe irritation. Rubbing lightly with a light mineral oil is useful when extracting burrs from coats. 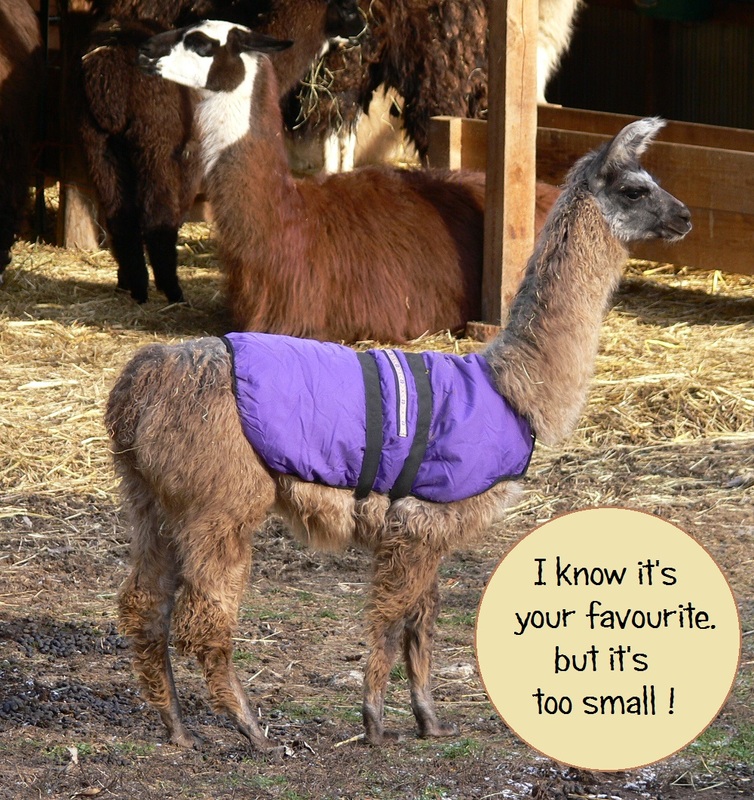 T he llamas coat is not only designed to keep them warm, but also to keep them cool in the summer sun. Acting as an umbrella, the coarse guard hair grows longer than the under down. This guard hair sheds the rain and shield the undercoat from the suns rays. Not all llamas should be sheared! Classic llamas should be brushed, rather than sheared. They suffer too much in the sun, from insect bites and from lack of warmth the following winter. (search this site for ‘Classic Llamas’ for more information). Some llamas may require a winter coat or blanket to keep them warm in winter. If they shiver, they’re cold and will not thrive! Llamas are communal poopers; they tend to designate specific toilet areas, usually along fencelines. Sometimes these piles of manure are not located where you would like them to be, but they will not eat from areas that have been soiled. This helps to avoid parasites. Something really important to bear in mind. All animals have parasites naturally, but a healthy animal will not get parasite burden. A parasite burden is a signal that something is not right in the animal or the environment. deal with the disharmony and the parasites will not thrive. Some keepers give their animals anthelmintics every few months. You should consider this carefully before doing this. Like antibiotics, routine use of drugs designed to kill parasites, bacteria and viruses. creates stronger parasites, bacteria and viruses as they adapt and develop immunity to those drugs. it is a wild merry-go-round that is creating super-bugs against which we cannot win. However, it is your choice as to whther to pay special attention to diet and environment or to depend on drugs for healthcare. Finding a vet who is knowledgeable about llamas may be challenging. Thankfully, llamas are incredibly robust creatures, so they seldom become ill. However, they are also incredibly stoic, meaning that they may be ill and show no significant outward signs. They do respond well to homoeopathy. Contact us for assistance.